The top of the mattress pad is cotton for comfort, and the fill is 100% polyester for some cushioning. There is stretchy material along the entire perimeter of this mattress pad including the pockets for a sure fit. This pad lays directly on the top of the mattress for protection. This mattress pad is not waterproof. Please choose the size you would like to order from the drop down menu. The price above reflects the price for a Twin size mattress pad. 95% of our orders ship within 5 business days. Please allow standard ground transit time depending on your location. 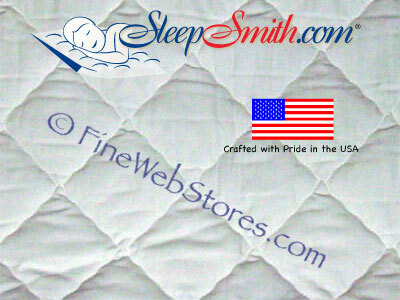 Deep pocket quilted mattress pad. Fits mattresses 7-15 in. thick. Made in USA.